Seven Stones is composed to a libretto by the Icelandic author, Sjón, whose previous collaborations with musicians have embraced a wide range of music(s), from Björk to opera. It has traces of the old sagas and the occasional explicit reference, both theatrical and metatheatrical, whilst coming close to what Wagner anti-historically claimed in Opera and Drama of myth, namely that it is true for all times. (I think we may say in response that it both is and is not, or at least can be and cannot be.) Music and story commence and recommence – recall the dual creation myths of the Bible, of the Ring, etc. 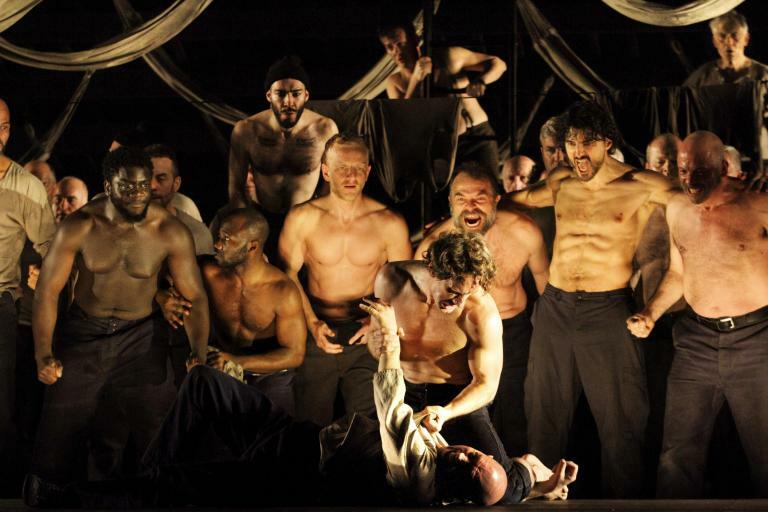 – when, having taken up his place in the pit and begun to conduct the chorus, the conductor turns to the audience and tells us ‘I was hit on the head by a stone’. (The opera is in English.) Soloists and chorus initiate a discussion concerning people who have been similarly hit on the head, after which the conductor, as if by magic (perhaps it is), finds himself on his own in the dark, initiating the story in which, as stone collector, he is the central character (and also observer). 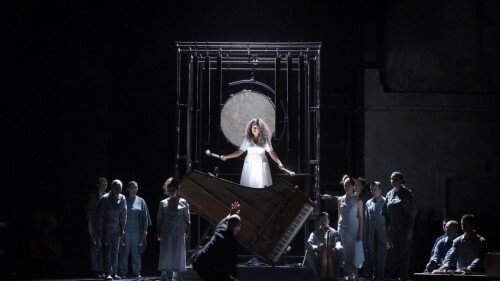 The combination of self-consciousness and myth is interesting, informing as it does the work not only of composer and librettist, but of a third participant in that workshop, director Éric Oberdorff too. Likewise soloists and chorus seem so strongly part of the work at every level – whether true or not – that it seems difficult to imagine them without it. Contrary to popular perception, Wagner rarely used that dread word Gesamtkunstwerk – indeed, almost everything ‘everyone’ knows about Wagner is, quite simply, wrong – but if the idea has any meaning left at all, perhaps it might lie in such intense and productive collaboration, a welcome festival alternative, even rebuke, to the everyday life of repertoire theatres. If I do not single out the various artists, it is not because they are not worthy of mention, but because they are equally so and seemed very much to be creating and re-creating themselves as much as roles. And so, the Collector tours history, his life, various spaces – in other words, various histories and myths – within a framework that works convincingly indeed as a whole. From the café U Babelsteinů and its introduction of Adámek’s invented instruments – played by the incredibly versatile singers of accentus/axe21 – to a tango-led bar in Buenos Aires, from a nursery-rhyme lunar eclipse (pierre lunaire!) to the tale of Christ’s stoning re-enacted at the café in a parody of the Baroque cantata, we hear, experience, and perhaps re-experience a number of stone tales, leading to the tragic closing realisation that, having been away for seven years on his mineralogical tour, re-encountered his wife and seen her embracing another man, the Collector has killed his own son. What he saw had simply been her acting as mother, nothing more; but it is too late. He picks up a small stone ‘from my kidneys, you are the song that I sing when winter refuses me shelter,’ and falls dead. Adámek’s music makes fascinating reference to many styles without merely speaking in them. It plays with notions of music theatre and seems to extend (sometimes in the manner of simplification or at least clarification) methods of modernist word-setting by composers such as Nono and Stockhausen. Perhaps those were just my terms of reference rather than something intrinsic. Homophonic or contrapuntal, ‘spoken’ or sung, a cappella or instrumental – for instance, a wonderful processional of rough music – yet often as part of a continuum rather than in binary opposition, music, tale, and music-as-tale are neither predictable nor arbitrary. That at least is how it seemed to me on a first encounter. Far from outstaying its welcome, it is finely judged in its proportions, at about eighty minutes (I think!) neither too short nor too long. Just like Janáček, one might say, albeit slightly shorter. Seven Stones may or may not point to a future of opera, but it is a work I think the future as well as the present will deserve to hear.